Are more tsunamis in the offing? Bangalore: The eastern Indian Ocean could well be the seat of another major earthquake in the coming years, much like the one that created the devastating tsunami in December 2004. The study shows cycles of tectonic strain build-up and relief that are about two centuries long and invariably end in two or more large earthquakes. The researchers are, however, unable to pinpoint a time. By measuring or estimating the strain in the fault beneath the eastern flank of the Indian Ocean, it is possible to say where a fault is likely to rupture but it is not possible to predict the time of rupture, says D. Shankar, physical oceanographer at the National Institute of Oceanography in Goa. “So, saying that it (earthquake) is likely in the next few decades is about the best that can be said today," he said. Like tree trunks, coral reefs have annual growth rings that record histories of sea-level fluctuations. 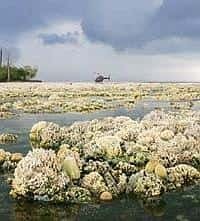 The changes in water level indicate that the islands subside during the long, quiet periods between earthquakes, but when they suddenly come up during earthquakes, the corals rise above sea level and die. Researchers, therefore, analyzed the cross-sections of ancient corals along a 700km stretch of the Sunda megathrust fault, which had been locked for at least half a century until a magnitude 8.4 earthquake in September 2007 struck the region. “If previous cycles are a reliable guide," said lead researcher Kerry Sieh, director of the Earth Observatory of Singapore, Nanyang Technological University, “we can expect one or more very large West Sumatran earthquakes as the rest of the Mentawai patch fails within the next few decades." We might not be able to do anything about the earthquake, said Shankar and his colleagues, but we can ensure that a functional tsunami (warning) system is in place and research is carried out to improve it. However, as Mint reported last week, part of India’s tsunami alert system has been vandalized by fishermen. Since tsunamis are infrequent in this region, unlike near Japan, and it is difficult to maintain a warning system. “It (the warning system) may have to work without a ‘result’ for a long time (maybe a few decades) before it is ‘used’," said Shankar. This lack of regular use makes it difficult to keep a system functional. “Maintaining a functional system may well be one of our biggest challenges." But researchers warn the next great earthquake and tsunami are “very likely within the lifetimes of children and young adults" currently living in the region.